This is the last post in the mini-series: Strange Dutch Celebrations. 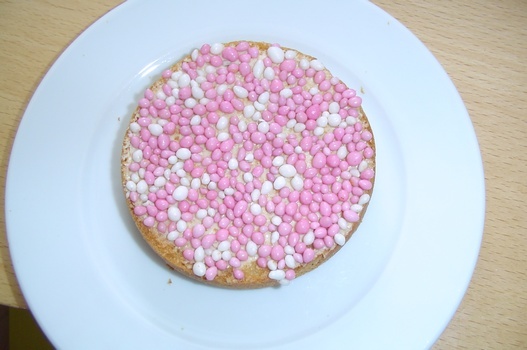 From these previous posts, we learned that Dutch people are a bit barmy when it comes to celebrating birthdays and anniversaries… So what happens when they have a baby? Well, my dear readers… you’re in for a treat! It’s about to get a whole lot weirder. Back home, in England, when someone has a baby… they will probably call their Mum… and then after a few days, the (hopefully) happy couple will get in touch with other friends and family to announce their new arrival. Some people plaster the event all over Facebook. Their choice. You just announce it to the whole street! With coloured banners, bunting, balloons etc (blue for a boy, pink for a girl) possibly a stork… and any other baby related paraphernalia you can think of. Situation changed! It sure has!! Then comes the baby announcement card aka the Geboortekaartje. Organised parents-to-be will have already selected the card design and the baby name, so when their little bundle of joy arrives… all they have to do is fill in the date, time and weight at birth. Oh and because they’re Dutch = the baby’s length! A very important detail! So. You’ve got your card – which means you’re part of the inner circle. Now to visit the little pipsqueak. Brace yourselves for the worst part. You need to eat a rusk with butter and aniseed balls on top. I’m not a baby. I don’t eat rusk. I especially don’t eat rusk with butter! I especially, especially don’t eat rusk with butter and ANISEED BALLS!! 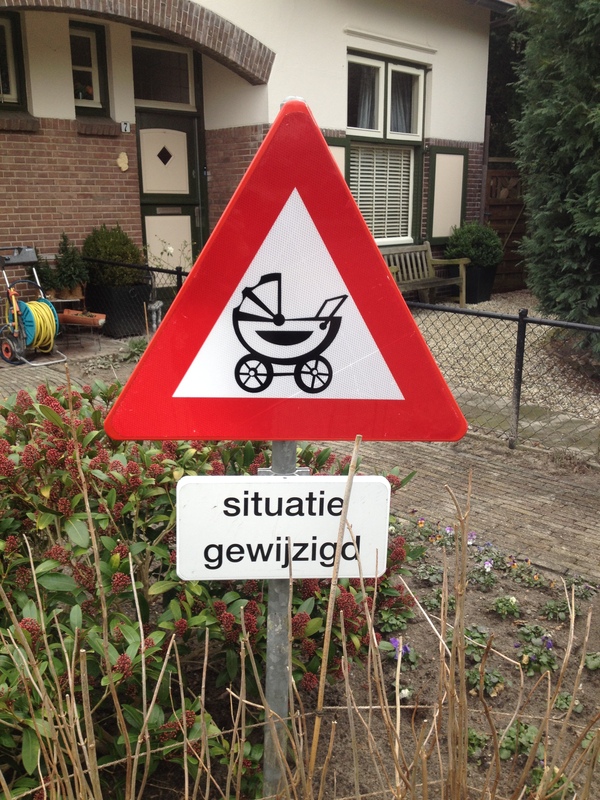 Yet, it’s a Dutch custom… so when a baby is born, you’ve got to do it. Beschuit met muisjes (literally: rusk with little mice, real meaning: rusk with aniseed balls) come in three types. White and blue balls for a boy. White and pink balls for a girl. And white and orange balls when a new member of the Royal family is born! Are you looking forward to geboortekaartjes dropping through your letterbox!? Wahahahaha!! 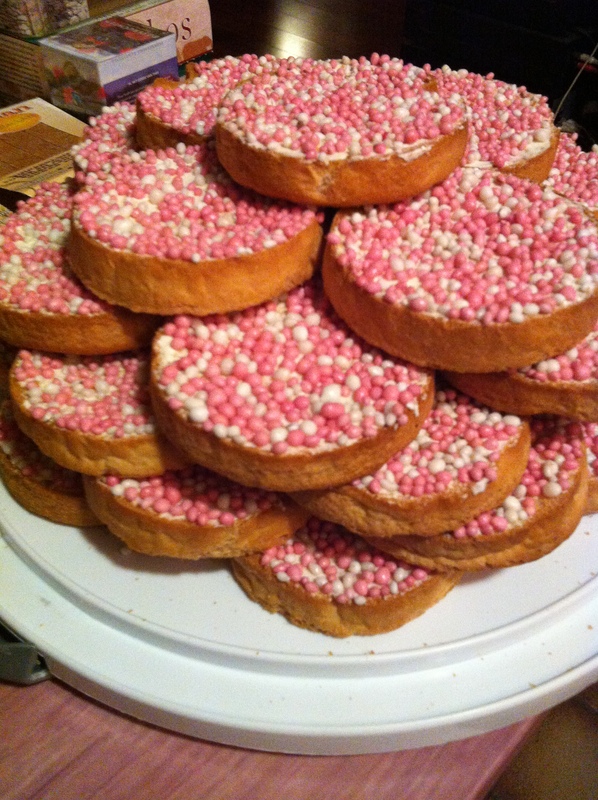 This tradition I’ve done, well, in the sense that I’ve received a geboortekaartje and eaten (sort of) the muisjes. Those suckers roll, even with the boter! Ha, a 24 hour labour, no pain relief obviously, to be presented with one to eat, hmm just what I fancied. Both of us being English and dreadfully polite I made my husband hide it in a bag and just left the crumbs on the plate. By number 2 I was much more acclimatised and direct. Then I prefer the Belgian way: Doopsuiker (Google it). Chocolate, coated with colored sugar, yum! Do you know why it’s called muisjes (mice)? It’s because the aniseed sometimes have a little tail that sticks out of the ball. You can also present it (for older brothers/sisters to treat their classmates for exampe) with ‘lange vingers’ dipped in chocoladepasta and then dipped in de ‘muisjes’. Poor Yank had to google rusk. But I know now! Being Dutch I was very disappointed when my baby was born in England and they did not record his birth length. A neonatal nurse tried to measure it a couple of days later, but it was very inaccurate. So we’ll never know his birth length and the number on his birth announcement is all wrong. You should try rusk/beschuit with fresh strawberries and brown sugar, delicious!